The Right Way is the Easy Way! 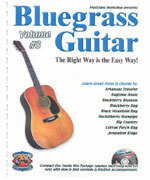 10 Bluegrass guitar solos to build & enhance your flatpicking repertoire. Each of the 4 courses includes step-by-step instruction on cassette tape with corresponding tablature for 10 Bluegrass instrumental standards. For every song, Dan gives you a fast version, a slow version and a phrase-by-phrase lesson, plus a rhythm guitar part recorded separately so you can practice your solos. Volume 3: Tunes include: Blackberry Blossom, Alabama Jubilee, Huckleberry Hornpipe, Big Country, Ragtime Annie, Arkansas Traveler, Black Mountain Rag (key of C), Cottonpatch Rag, Blackberry Rag, Jerusalem Ridge. (CD & Tablature) -------------------------------------------------------------------------------- About Dan Huckabee Dan Huckabee, has a degree in Music from The University of North Texas. He won the National Dobro Championship, & has played with The Allman Brothers, Lyle Lovette, Nancy Griffith, & Robert Earl Keen Jr, just to name a few. Dan founded Musician's Worskhop in 1973, teaches Guitar, Dobro, Mandolin, & Harmony Singing at The University of Texas Informal Classes, has taught workshops & seminars at festivals all over the United States, & has authored over 250 music instructional products. So get comfortable & let Dan's lifetime of musical experience guide you through everything you need to know in the quickest & easiest way possible!